What: Father’s Day BBQ & Artisanal Craft Beer. Treat Dad to the Best BBQ and Best Belgium Beer on Father’s Day! Details: All You Can Eat Fathers Day BBQ, $25 per person, Kids $12.50. Plus we are featuring Artisanal Import Craft Beers from the Artisanal Imports Portfolio. This is going to be one GREAT Father’s Day!!! Artisanal is one of our favorite beer importers. Artisanal Imports has one of the best collections of small breweries from Europe. And this Father’s Day we are featuring them in our garden. They import great titles like, La Trappe, De Proef, Urthel, Bosteels, St Feuillien and many others. 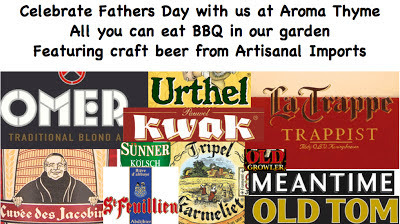 Treat Dad to the Best BBQ and Best Craft Beers on Father’s Day! Menu from our grill in the garden.